My great-grandfather Frederick Ashby (1851-1943), left a hand-written memoir in a school exercise book describing part of his life, from childhood to 1897, and covering some eventful years in the Royal Navy followed by 20 years of his service as a Coastguard. This included service in various North Devon Stations, 4 years at Rosslare (Co. Wexford) and a spell in Great Yarmouth (Norfolk). Below I have only included the part of the memoir referring to his time in the Coastguard Service. Frederick was born in Saltwood, near Hythe, Kent in 1851. His father, from an agricultural family in Suffolk, was in service and later worked in various transport-related jobs at a military camp, a brewery and with Pickfords. Frederick’s mother died when he was 9, he left school before he was 12, and joined the Royal Navy at 14. 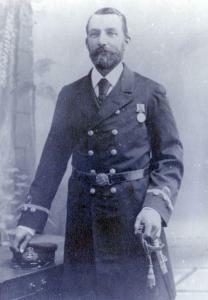 He was invalided out at 28 (by which time he was Lieutenant Ashby) and joined the Coastguard Service, a traditional career move for naval men at that time. He described his medical problem as a heart condition caused by much violent boat exercise when the ship’s crews competed in rowing competitions. Nevertheless he lived to be nearly 92. One of his grandsons, John, and another great-grand-daughter, Hazel, transcribed the memoir and had it printed for the family, after undertaking much interesting research into the details. 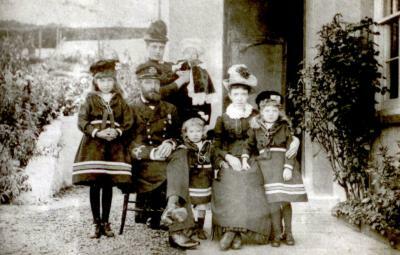 They deduced that the memoir must have been compiled about 20 years after the last date given in it – it ends when he became Battery Officer in the Coastguard Station at Stonehouse, Plymouth in 1897. They conclude he must have kept diaries or notes since so many details are accurate. We don’t know why he stopped writing up his life when he reached that year. Perhaps he simply lost interest or found it painful to recall the years of his wife’s long illness before her death in 1902. He retired from naval service in 1906. The memoir gives a fascinating taste of his duties, training and experiences in the Coastguard Service, with sidelights on life for the family. I have kept the text very close to how he wrote it, including most of his abbreviations and sparse punctuation, but adding a few stops, commas and paragraphs to improve readability. At the end I have included a few explanatory notes based on our collated research. 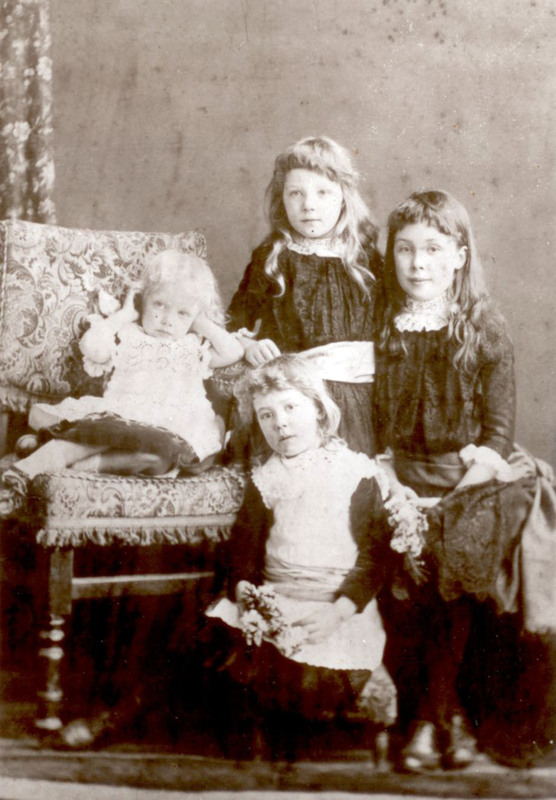 Front row left to right: Birdie (9), Frederick, Marjorie (3), Louise Ashby, Carrie (6). 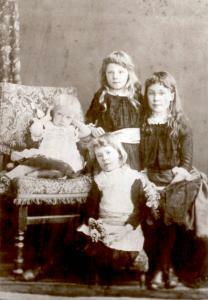 At the back, Pollie Downing holding baby Fred This posed photo taken by Andrews of 13 High Street Wexford shows young Fred with his sisters Marjorie, Carrie, Birdie. ...On arriving at Portsmouth our home port we were ordered to Chatham to strip and pay the ship off which we did on the 7th July 1877. Prior to our separation, on examination by the ship’s surgeon I was placed for survey and invaliding out of the service owing to so much violent exercise on boat exercise having affected the heart causing debility. Amongst my chums in the ship, were some who were joining the Coast Guards and who hearing of my position persuaded me to also have my name submitted as a candidate (the doctor being agreeable.) All our applications were approved and on the expiration of our paying off leave 7 of us joined H M S Resistance the Liverpool District Ship at Rockferry, I travelling with my old friend Hennessy from Canterbury who on arrival at Birkenhead and both being very hungry and entering a cookshop he ordered 1 dozen boiled eggs, but on being served up and finding them hard I left him to eat ¾ of them. I mention this because the hungry humour at the time left its deep impression on my memory. We were not long before we again embarked in the Cutter “Margaret” for our Stations and with us for the same division Ilfracombe was also one of our old shipmates named Jefferies who was for Minehead. Hennessy going to the Head Station Ilfracombe and I to that unique and historical place Clovelly in North Devon made famous by Canon Kingsley a one time Rector in his “Westward Ho” and other Books. On arrival at the Stn. I was heartily welcomed by the Chief Officer Mr Burnley and the crew the majority of whom were composed of the old revenue cutter men and whose services being retainable till age 60 had been long periods there, one old Dunn for over 25 years. On introduction to my quarters I found it partly furnished with Tables, Chairs and a Bedstead, so was not long in getting my own service bed & blankets into use on the latter for sleeping. For food my neighbours were kind to help me in, whilst watch keeping and until my wife arrived with the remainder of our goods & chattels by Mr Jeffery the carrier from Bideford and Canterbury. Of this last sequence I must here relate a humourous incident. On arrival by rail at Bideford at P. M. whither I went to meet her and on going to the usual Refreshment Tea Rooms used by the Clovelly people the real thick Devonshire cream was part of the supply. As it was new to her, and I having only recently heard of its good qualities, I gave her some in her tea, but she exclaimed that she was not drinking that with the grease in it thus ensuring a hearty laugh amongst our fellow travellers also at tea there. Of our life at Clovelly for nearly 3 years we were well pleased. The Nth. Devon dialect combined with interesting and humourous friends there made the time pass all too quickly. The new duties of shore watch keeping, the calls and turn outs with the life saving apparatus during the stress of gales were exciting and strenuous. Mr Burnley was very good in assisting me in the C.G. clerical and storekeeping work so that I soon qualified for the next rating of promotion and a vacancy for one having occurred here, 15 months after joining found my old friend Hennessy the likely one to get it and join us, and still being single he boarded with us for a time when another vacancy taking place at his old Stn. he returned there and shortly afterwards was married. In Decbr 1879 – 3 days after the Tay Bridge Disaster, our daughter Birdie [Note 1]was born and in April 1880 much to the regret of my Chf Officer and boatmates I was removed by the “Margaret” Cutter to Ilfracombe and thence by road to Croyde detachment to fill a vacancy with a promise of early promotion. Before finishing with my first Stn. I should like to point to the then cheapness of living, one item alone, butter to wit, being during summer months and earlier in May, 10d a lb. when we used to get from 30 to 40 lbs. potted in for winter use by Mrs. Fulford of Hartland. Being also a fishing village we came in for a plentiful supply of cheap fish and as a part of our duties consisted in seeing that the vessels and boats were registered, lettered and numbered, I used in my spare time to do their lettering for them in return for some fish. Thanks for posting this article, a superb insight into the life and work of a Coastguard. Thank you for the superb photos.Genealogical Sources can build a framework of a past ancestor but the memoirs of Frederick Ashby fill the framework so well that one can now imagine the whole man and his loving family. Thank you for sharing him with us. What a splendid Victorian family photograph! Everyone should write an acount of his life's activities to inform his grandchildren and posterity. My grandfather John James Montgomery may have served with Frederick at the Great Yarmouth Devonshire Road coastguard station, but I can find mention of him in grandfather's papers. July 1877 transferred from Monarch to Cg service . If you have any info on yr great grandfather's ships you maysee a link!